At present the territory of the park «Nalychevo» covers an area of 287 thousand. Ha and includes the valley of the river. Nalycheva with access to the Pacific coast. Nalychevo park is surrounded by mountain ranges, which are arranged in a horseshoe shape on the south, west and north sides, and are made up of ancient extinct volcanoes such as Kozelskiy, Dome, Vershinsky and four acting — it Koryaksky, (3456 m). Zhupanovsky (2927 m), Avacha (2741 m) and Dzenzur (2155 m). 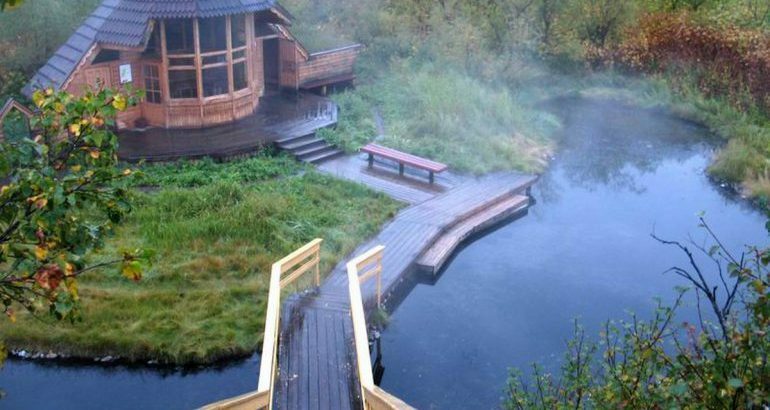 One of the most interesting attractions of the valley — a unique hot springs that are scattered throughout the park, there are over a hundred! As for the thermal output of water, even on the Kamchatka standards such concentration of sources is very high. They consist of nine groups. The central group is the most powerful, composed of Nalichevo, Goryachenskih and Zheltovsky. North — Talovskie, Shaybinskie and regional studies. Next — Upper Dzenzurskie (fumorolnye). In the south, at the foot of the volcano Aag are Aagskie and Shumninskie and cold mineral springs, called tourists Aagskie fitter. 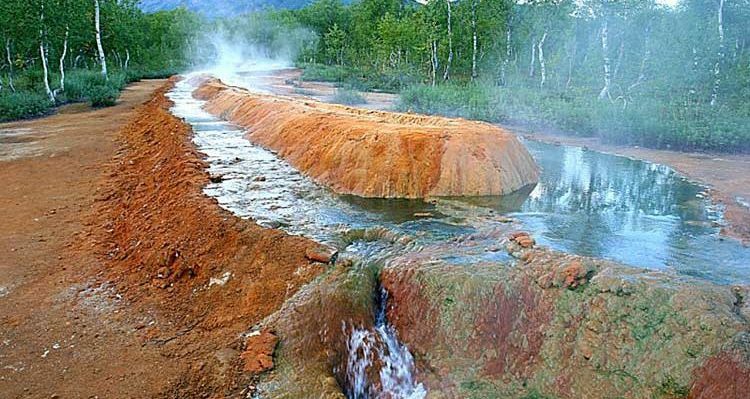 These sources of water having a temperature of 14 to 78 ° C, the total flow rate is 200 l / s. The largest hot springs have a unique chemical composition, which is found on the planet in a few cases. They are weakly acidic or weakly alkaline, contain large amounts of rare elements such as fluorine, bromine, iodine, lithium, rubidium, arsenic, boron, titanium, strontium, antimony, germanium, and others. Another one Nalychevo Valley attractions include Travertine shield. Over the years, sources of fat, rich in various substances, formed the so-called travertine shield. . A smaller part of about 50 thousand square meters, is located on the surface and forms a so-called «boiler» — a vast shallow area travertine. On top of it is parched crater 1.5 meters deep, ceased operation after drilling research, conducted in the years 1958 and 1959. Prior to drilling, this crater is the main source onto the surface of the water, and because of its rapid functioning of the Travertine area became known as «boiler» Griffin Ivanova. At the site of one of the drilled wells formed thermal spring, named griffin Ivanova (in honor of Russia’s largest hydrogeologist V. Ivanova). Depth griffin is 200 meters, the water temperature — 75,6 ° C. Griffin water have very high concentrations of various chemical substances such as arsenic, calcium, iron, boron, lithium, silicon, magnesium, sodium, potassium, barium, antimony, bromine, chlorine, iodine, zinc, lead, tungsten, strontium. 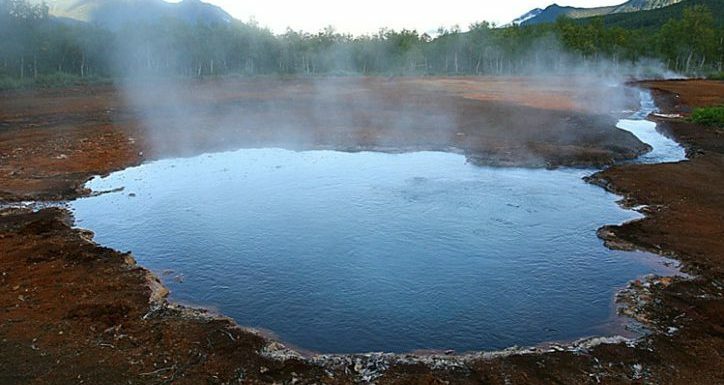 Besides the beautiful scenery of the valley you can visit the curative thermal sources (pools), which perfectly improve their health and will add vitality. Medicinal properties have been known izdrevne. Itelmen According to legend, the man who in the morning with the first rays of the sun plunge into the source, will find beauty, health and eternal youth. Whatever it was, but the water in these sources of healing. As for the chemical composition of water Nalichevo sources, it has been studied in detail, the staff of Tomsk SRI of health resorts and physiotherapy. 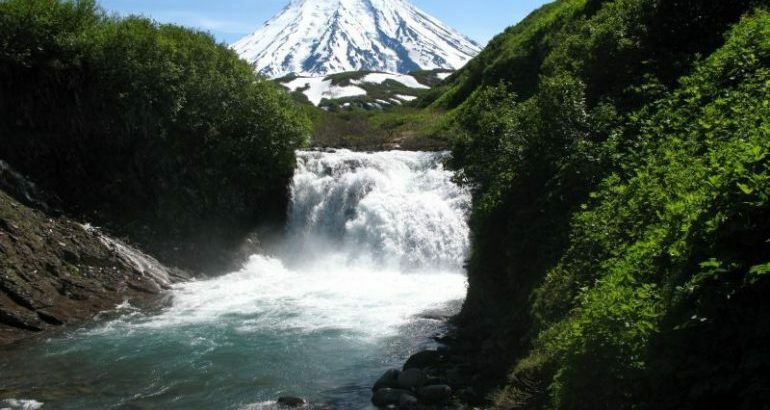 On the composition of the water has no analogues in Russia and the only one of its kind in Kamchatka !, have the ideal concentration of biologically active components, and as a result, have unique healing properties. Indications for the use of water: treatment and prevention of diseases of the musculoskeletal, cardiovascular, peripheral and central nervous systems, gynecological, skin diseases especially psoriasis, diseases of the gastrointestinal tract, urinary tract, liver, metabolic disorders, anemia. Sources ennobled good enough, there is a large room where you can rest and change clothes, have platforms to get into the water, or just sit and chat feet in the water. In general, all for healing rest. Also in the central part of the park for holidaymakers built cozy cabins, lookout tower, several indoor bonfire, there is also a place for the camp. The administration of the park for a fee you can take advantage of satellite communication services. Slipper macranthon — a plant listed in the Red Book. Flora Nalychevo Valley diverse. Most of the territory is covered by high-forests, widespread stone birch. Nalychevskaya valley is rich in edible berries, such as honeysuckle, blueberry, crowberry. 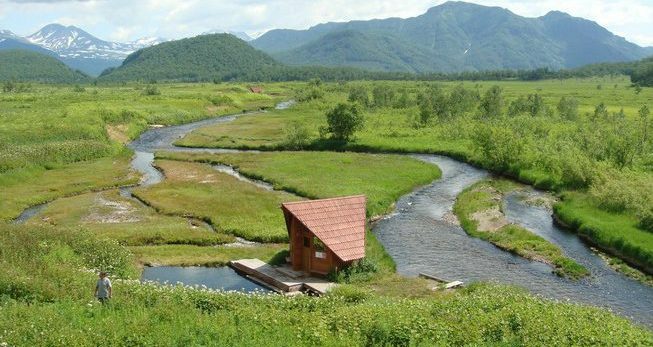 In total, the park more than 500 species of plants, many of them are included in the Red Book of Russia and Kamchatka. The most rare and interesting plants, widespread in the park include Rhodiola rosea, lily Dahurian, Cypripedium Macranthos and slipper Yatabe, as rare plants growing near the hot springs — uzhovnik warmwater, fimbrilistis Okhotsk and oreorhis spreading also listed in the Red Book, and belonging to specially protected plants Kamchatka Territory ..
Due to certain mikroklimotu and diversity of vegetation in the park inhabited by a large number of animals and birds, many of which are rare species. In total there are 33 species of mammals, the largest among them are the brown bear, wild reindeer and bighorn sheep. Nalychevo is a place of seasonal concentration of brown bears in the period of spawning salmon and ripening berries. Bear Date with a man are not uncommon, but most of the year bears do not show any aggression (with proper human behavior). In the central part of the park it is often possible to observe the bears in the vicinity of 30 to 100m. Natural Park «Nalychevo» — is also the habitat of the wolverine, wolf, fox, lynx. sable, river otter, American mink. In the valley a huge number of species of birds, over 120 species! and there is no place where they could not see or hear. Arrangement of the houses in the park .. Walks to Goryacherechenskim Zheltorechenskim and hot springs, thermal group «Boiler». Day 2. Radial access to Aagskie (Chistinskim) narzans. This is one of the most beautiful trails of light. and runs along the mountain tundra, which okryvaetsya beautiful views of the extinct and active volcanoes: Aag, Arik, Koryak, Avachinskiy. The length of the route to Narzanov — 9 kilometers, still 3 kilometers away is the waterfall on a noisy river. The water source is pleasant to the taste, the composition is close to the Caucasian narzans. Return to Central cordon. Here, everyone can experience the healing properties of the bath.